While many beginners may flock straight to Squier to satisfy their Strat desires, the sensible beginner will know that Yamaha’s Pacifica Series has just as much – if not more – to offer students, as well as experienced guitarists. The Pacifica 112V is a longstanding staple of the respected collection, proving one of the best guitars you can buy for under $300. Here’s our full review! On first glance, the 112V could well be one of those Strat copies we mention, yet – as you take time to appreciate it – you realize it is pretty unique. Its body certainly does take a lot of inspiration from the beloved Strat, with a sleek double-cutaway shape, yet the shape used for the Pacifica Series is a little squatter and more curvaceous with longer horns. The tonewood of choice on the 112V is solid alder, which is a very good material for an affordable guitar such as this. Of course, there are a few cool finishes to choose from, the highlights being the vibrant Red Raspberry or the vintage Sonic Blue. 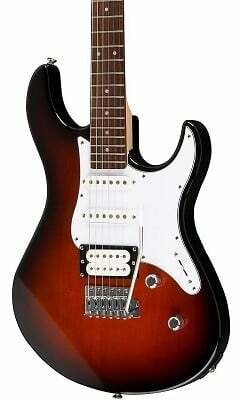 Like a Strat, there’s a 25.5” scale length and a bolt-on maple neck, along with a rosewood fretboard sporting 22 frets. With a thin satin finish, it’s sleek and very playable. Ultimately, this is a step up from the more basic models in the Pacifica collection, and it shows. While the body is very similar to a Strat – which can only be a good thing – the electronics show why this guitar should be on the radar of the more rock-inclined guitarist. Instead of three single coils, you get two single coils in the neck and middle position, along with a humbucker at the bridge. Regardless of the style you are going for, having that humbucker offers great versatility – especially as it has a coil-split function. Although they are in-house stock pickups, the quality is decent. As for controls, the pickups are wired to a single tone and volume knob, along with a pickup select switch. Elsewhere, the bridge is a synced tremolo design with six fully-adjustable saddles. It’s not the best bridge out there, even in this budget market, but providing you don’t abuse it too much it will keep your tuning stable while allowing you to enjoy adding a touch of vibrato to your playing. On that note, the tuners fitted on this guitar are your average die-cast machine heads – pretty precise, but again, nothing outstanding. Hardware is another point where Yamaha clearly borrowed some solutions from Fender. The bridge is a synced tremolo design with six fully adjustable saddles. These bridges are not something you really want on an entry level guitar, mainly because they need to be of certain quality in order to work and not mess up the intonation. However, the one Yamaha installs on these Pacificas is rather decent. If you don’t abuse it too much, it will work pretty well. Tuners fitted on this guitar are your average die cast variety. They are pretty precise, but you definitely don’t want to push them too far. Overall, the hardware is on par or even better than what most guitars in this price range have to offer. Viewed through the prism of affordable electric guitars, the Yamaha Pacifica 112V packs a decent punch. That humbucker at the bridge position is capable of dealing with gain-rich distortion very well, making this a solid choice for guitarists who play rock, punk and metal. Yet, it still delivers warm, crisp cleans that make it a sensible choice for blues and jazz too. The middle and neck pickups are great when you want to muddy up the tone a little, especially with a nice layer of overdrive on top. 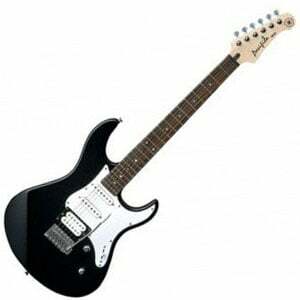 The overall theme of this guitar is versatility and that is reflected through its tone as well. While the Pacifica 112V may not be the best guitar in the world – even the sub-$300 category – it remains one of the best beginner models you can grab. It’s reliable, flexible, fun to play, and looks pretty cool. With better attention-to-detail and better tonewoods, it’s also a step up from the more affordable Yamaha PAC012 and is well worth the extra cash if you plan to stick with the instrument. For more info about the Yammy PAC112V, click here.